While there are many cakes that are perfect for celebrating birthdays and other special occasions, a two layer Vanilla Cake covered with Confectioners Frosting is especially popular. I really like this Vanilla Cake's sweet buttery flavor and light and moist texture. The frosting used to both fill and frost the cake also has a sweet and buttery flavor with a light and fluffy texture. To further decorate the cake, you can pipe some of the frosting around the top and base of the cake in a pretty design, and candy dots pressed into the frosting finish the look. This Vanilla Cake is what is commonly referred to as a 1-2-3-4 Cake. Popular since the 19th century it is an easy cake to remember. The numbers 1-2-3-4 refer to the quantities of ingredients; 1 cup butter, 2 cups sugar, 3 cups flour, and 4 eggs. I have cut back a little on the amount of sugar, but otherwise the recipe is the same. This cakes uses the 'creaming' method where the butter and sugar are beaten together first and then the eggs, followed by the flour and milk are added. So not only is this recipe easy to remember, the cake is also easy to make. We are using regular all purpose flour (plain flour) but if you want a more tender and delicate crumb you can substitute the all purpose flour with cake flour. Also, if you want a cake with a lighter texture you can separate the eggs and beat the egg whites separately until soft peaks form. Fold the beaten egg whites into the batter after you have added the flour and milk. You can use either full fat (whole) milk or reduced fat (2%). Full fat milk will give this cake a richer flavor. Once the cake layers have been baked and completely cooled, we are going to frost the cake with a classic sweet and buttery Confectioners' Frosting, also known as Vanilla Frosting, Butter Frosting, or Buttercream. It is not what you would call a real buttercream, that is, one that is made with eggs and a sugar syrup. Confectioners Frosting contains just confectioners sugar, butter, vanilla extract, and a little milk. Its' light and fluffy texture comes from beating these ingredients together for a long time (about three to five minutes). The end result is a frosting with a nice spreading consistency. You do not want it too thick or it will tear the cake, or too thin as it will run. So if you have to, adjust the milk and/or sugar until it is just right. Now, one of the great things about this frosting is that it colors so nicely. My preference is the gel pastes sold in small jars, which can be found at cake decorating store and Michaels. 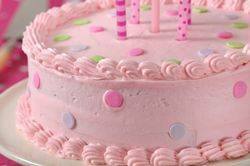 For this Vanilla Cake I have used a pink gel paste. The frosting was used to fill and frost the cake plus to pipe a border around the outside edge of the cake (I have used a Wilton star tip Number 18). Once the Vanilla Cake was frosted, I pressed candy dots (amazon.com) around the sides of the cake and on top. Vanilla Cake: Preheat oven to 350 degrees F (180 degrees C) with rack in center of oven. Butter or spray with a non-stick vegetable spray, two 9-inch x 2 inch (23 x 5 cm) cake pans. Then line the bottoms of the pans with parchment or wax paper, then spray the paper. Evenly divide the batter between the two prepared pans, smoothing the tops with the back of a spoon or an offset spatula. Bake 27 to 35 minutes or until a toothpick inserted into the center of the cake comes out clean and the cake springs back when pressed lightly in center. Confectioners Frosting: In the bowl of your electric mixer, or with a hand mixer, beat the butter until smooth and creamy. Beat in the vanilla extract. With the mixer on low speed, gradually beat in the sugar. Scrape down the sides of the bowl as needed. Add about 2 tablespoons of the milk and beat to combine. Then, on high speed, beat frosting until it is light and fluffy (about 3-5 minutes). Add more milk or powdered sugar, as needed, to get the right spreading consistency. If desired, color the frosting with food color (I use the gel paste food coloring that is available at cake decorating stores and party stores). Assemble: Place one cake layer (bottom side facing up) on your serving plate and spread with about 3/4 cup (180 ml) of frosting. Place the other cake layer (bottom side facing up) on top of the frosting and cover the entire cake with the remaining frosting. Can place some of the frosting in a piping bag and pipe a decorative border around the top of the cake (I have used a Wilton star tip Number 18). Cake can be covered and stored at room temperature for several days.